Hoover, leader in the floor-care sector and international brand with a strong innovative profile, has been presenting itself as a market trend-setter for over a hundred years, introducing innovative, hi-tech products with a meticulously accurate, cutting-edge design. It offers a full range of small and large free-standing and built-in appliances for the high end of the market. The Hoover brand has innovation in its DNA as well as the desire to challenge the status quo and the will to push past the boundaries, also by introducing unexpected technologies. For Hoover, innovation is not just about creating something new, but the explosive impulse that drives us to imagine better solutions. Today a new generation of consumers is demanding personalised solutions for themselves and their family. This is why each Hoover product is designed to cater completely for every need and every lifestyle. Because in order to take care of a consumer’s homes, food and clothes, it is important to understand their preferences. All this means providing "bespoke solutions". The best products not only work perfectly but also express the personality and style of the person who owns them. The superior design offered by Hoover is the result of a process aimed at perfecting the details which make our customers’ homes more functional and beautiful and transform our products into a daily source of satisfaction. Hoover, founded in Ohio (USA) in 1908, the year in which it patented its first vacuum cleaner, is today in its second century of activity. Thanks to its firm foundations as European leader in the floor-care sector, it also has a strong position in the high end of the market for large free-standing and built-in appliances. The latest frontier explored by Hoover is the premium segment of the ironing systems market. All Hoover products, including both large and small appliances stand out for their hi-tech profile and focus on design, not to mention their exceptional performances and close attention to detail. Today the brand offers the appliances set to be the standard of tomorrow. It targets consumers with a passion for innovation and technology, who are typically young and live in large urban centres (Young Urban Techies), consumers who follow fashion and design by adopting consumer styles considered “trendy” (Aspirationals) and young couples, single persons and young professionals experiencing the electrical appliance market for the first time (Unengaged Discoverers). In Europe, it all began back in 1919 with the company Hoover Ltd. in London. In 1932, Hoover's first European factory opened in Perivale (Middlesex), for carpet sweepers. 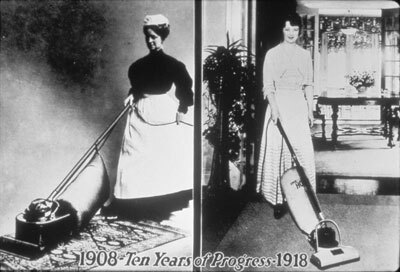 It was the beginning of a success story which would bring Hoover to the leadership of the floor-care sector. In 1937, Hoover Ltd. was listed on the London Stock Exchange, with the American parent company retaining the controlling interest. In 1946, the Cambuslang plant in Scotland began production of the canister vacuum cleaner. In 1948, the washing machine production plant in Merthyr Tydfil, Wales, was opened, confirming Hoover’s status on the British market as a leading brand of large appliances. On the wave of its continuous expansion, in the 1980s, Hoover reorganised its production and company structure. From 1985 onwards, a series of ownership changes took place: Chicago Pacific Corp. bought Hoover’s international business, while in 1989 Maytag bought Chicago Pacific and therefore Hoover too. In 1993, the Hoover European Appliances Group was established. In 1995, Candy acquired the Hoover European Appliances Group from the Maytag Corporation, including the exclusive brand rights for the whole of Europe, all the territories of the former Soviet Union, the Mediterranean area and some of the Middle East. Local agreements would also then extend the company’s sales licences to include Australia, New Zealand and the Gulf countries.